After being saved from a life of sin, I was so hungry for God, I chased Him with all my heart. The Lord had grace on me, and led me through much inner healing. It was during that time that I started seeing Jesus. He would come and minister personally to the parts of me that had been so deeply wounded as a child. As I reached out to love others, God began “showing up”. I would see people healed physically and emotionally through my prayers, sometimes I would “see” pictures and hear God speak or sing to them. Now, often times when I worship, I can see Him. 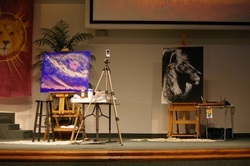 In 2009, several people prophesied to me, "Jesus wants to paint with you." I did not know what that meant, so by faith, I just went into my studio and waited. Then He was there, I was seeing Him with my eyes open, this was something new. I had no idea what we were going to do together, but He led me each step of the way. We painted together for 4 hours. It resulted in the painting titled, "Poured Out" In that time, He told me to "start buying your paint by the gallons because you are going to pour much at My feet." Glory! I was at an event in 2006, asking God to open my eyes so I could see in the spirit, when a very large presence that felt like a ball came from above and hit my stomach. It pushed me back about 10 ft or so, causing me to gasp for air. No one touched me, or prayed for me...but I ended up flat on my back on the floor. "Delight yourself in Me, and I will give you the desires of Your heart." 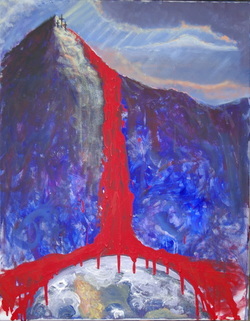 The Lord began talking to me about painting for Him at the beginning of 2007. This is the timeline of events that led me to where I am today. In December I emailed another artist that was painting prophetically and told him that it was in my heart to do personal prophetic paintings. He wrote back and said, my work carried, "lots of light and was pure." I had never heard of anyone doing anything like that, but I wanted people to be able to see what I was seeing. Now that same artist does them too, and also teaches them in his classes. I had many prophesies that I would clothe, house and feed orphans all over the world. I did not know how I would ever do that. One of my spiritual fathers came to Raleigh sometime around then, and there were prayers and prophecy, about God releasing me, and there was a woman that I showed photos of my art to and she just started crying and saying, "God is going to use your art to bring much money into the kingdom." I just kept saying, "Really?" Not long after that, I went to see Chad Taylor and he prophesied to me, "I see the broad strokes of God, on the canvas of your calling" and then he said to me, "Paint me a picture." He would be the first of several prophets to say that to me. When he said it, I saw the silouette of a man jumping in and out of fire, and I heard, "in and out of the fire." I didn't know the name of his ministry was Consuming Fire Ministries. It was God's way of encouraging me to go ahead and do the prophetic portraits. In February, I came across Jonathan Helser's music and that led me to his Dad, Ken Helser. He is an artist, minister, writer and musician for the Lord. After I read his testimony on the website, I felt led to send him an email, thanking him for "messing me up" and for his love for the Lord. He emailed me back, saying, "I am glad it messed you up" and we began emailing back and forth, he said my email brought him to life. He was encouraging me to do what God had put in my heart. "Pray that you do that which you love. Long ago I heard something from the writer and magnificent Christian, Watchman Nee, who said, "You know you are in the will of God when you do what you do and it is life back to you." That is what art has been to me: LIFE BACK TO ME. If it is to you, then do it with all your might. He suggested I get his CD with the story of the Spread Your Wings painting of a butterfly he had done. I told him about an artschool I used to have for children called, "rainbowskiesandbutterflies.com"
Not long after that, a woman from a local church, called me and asked me to come and paint at the grand opening of a new worship center in the area. I said I would pray about it, but in my heart I was screaming "NO!". The same day the CD arrived from Ken, and I was eager to hear it; certain God would use it to speak to me. The story of the painting was about a woman that had struggled with depression and suicide for many years, but was finally set free when she was asked to get up and sing in church. When people asked her what it was like before she was set free, she said it was like being a "butterfly caught in a mason jar". Ken went on to share about how his daughter was going through something hard, and how she begged him to rescue her, but he encouraged her to persevere through it. In her pain, she wrote a poem and called the butterfly and the mason jar. He was so proud of her, he decided to get a jar, with a butterfly, and he was going to release it after she read her poem. But the butterfly would not fly. I was so convicted because I knew that God was asking me to FLY for Him. I had seen so many of those yellow butterflies in Ken's painting. He also wrote her a song to honor her perseverance. Here are some of the words. Spread your wings, cause you were made to fly. Beautiful creature is held back by glass walls. She's afraid to fly, she's afraid she might fall. She was created for Love and for Joy. "YES, YES, YES!" I will paint for you Lord. The coolest thing for me was, I had been seeing those same butterflies everywhere, the Eastern Yellow Swallowtail. I have lived in my house since 1993, and never seen so many of them, and have not since. God was speaking. So, I went to the worship center the next day and got on the stage, I was still afraid, but I did it. I turned the easel so that no one could see what I was painting, but that was my first time painting up front as part of the worship team. When I was there, I quickly would paint several images. As I finished them, I would lay them down on the stage. One of them I painted in black and white, of a man, "chill-laxing" under God's wing. A man came up and asked if he could buy it. He was covered with piercings and tattoos, somehow I knew it was for him and told him to just take it. Then I shared with him that it was from Psalm 91. He lifted his sleeve as he said, yes, I know. Right there on his arm was that scripture. More confirmation. I also painted another one of myself, worshiping in the rain with fire coming out of my hands. Something that I see and feel often. A woman came up to me and asked for it. She just kept saying, you have no idea what God is going to do with you, but you are going to be amazed. She had the painting matted and framed, and she still calls me periodically to encourage me. The song below is by Ken Helser's son, Jonathan. God used it around that same time to encourage me to spread my wings and fly. After that, a woman announced at a meeting I was attending in SC that she was having a conference about Dreams. If anyone had something they would like to add, especially artists, to please see her. I went up and expressed interest in doing Prophetic Portraits, something the Lord had been stirring in me to do for years, but I did not know of anyone else doing them. I knew I saw pictures when I prayed for people, so I figured, if I painted it, they would not "lose" the word the Lord was giving them. I went to the conference in July, 2009, in Charleston SC, set up my booth and laid out my sign up sheets. At first not many signed up, but as the conference went on, people began lining up for them and I was doing them constantly, in the back, trying to meet the demand even as the speakers were speaking. I ended up doing almost 75 of them that weekend. It was amazing! I laughed and cried with the people as I painted for them. Sometimes I would tell them what I thought the image meant, then they would tell me what it really meant. I was undone. During breaks, I would get before God, humbled by what He was doing. All the way home, after the conference I wept...just undone by how our Papa loves His children. At that conference, I felt like Cinderella. I was in a corner, in the very back, and I was happy there, but at one point they called me to the front and had another artist pray for me. I had so many women around me as I sobbed on the floor. A woman looked at me and said, "God is cleaning out your pumpkin'" A man I had done a prophetic portrait for said he wanted to purchase a carriage ride for me, so I could see Charleston. And the place where I was ministering was called the ballroom. It was truly a "coming out" place for me. Since then I have been to several other conferences and done them, I have even done them for people right over the phone and in healing centers. I have also helped and encouraged other artists to step out of their comfort zone and allow God to use them as His prophetic paintbrush. After that conference, one of the ladies I had painted for said to me, you need a website, so, I found a free hosting place, and built one. I had never built one before, but I put it together for free, just the cost of the web address that I already had. I started going with my spiritual leader to meetings he was leading, I just tagged along and he let me. I would paint in corners, and closets, anywhere they would make space for me. He constantly encouraged me to "go up front," but I would try and fail. While I was doing this, I met a man from Africa. He asked me, do you know how to go to heaven to get your paintings? I thought that was a little weird, but not wanting to be impolite, I played along. He said he would teach me how to go to Heaven because God had paintings he wanted to give me from there. So he "took me" to a place I call the art room. Jesus often times meets me there, covered in paint, brushes in His hand. It was after I spent some time in there, that I saw the Lion on my front page. I went back the next year, to the original place I first stepped out in Charleston for a conference and to do prophetic portraits, Akiane was there and I got to meet her. It was a dream of mine! I was working for Elijah List when they did the article about her, and I knew how Jesus would come to her. She shared about her paintings, and I was so convicted by her faithfulness, that I asked her to pray for me, that I would be faithful to get up and paint. Although I had painted that one time at the worship center, I had only done it a few times after that. I cried as we prayed together. I showed her how I do prophetic portraits, explained them to her, and a month after I did, she started doing them too! In her sharing she said that she used 36' x 48' canvases, and it stuck with me. After that, I went to heaven, and I had the vision of the Lord as a Lion, and I wanted to paint it, but I was praying about how. I would look at so many pictures, to try and recreate what I had seen. There was a meeting coming up that would be at the same place I had gotten up to paint before, where I had kept my canvas turned away from people seeing it. The Lord started speaking to me, it was time. Then I started seeing butterflies everywhere, I saw about 100 of the Eastern Yellow Swallowtails like the one in Ken Helser's painting. I have lived in my home since 1993, and never seen so many of them in my yard, and have not since. I contacted my pastor, and told him I was finally ready, asked him if I could paint as part of the worship team, he said yes. He had encouraged me over and over for many years, but I was not ready. Now I finally was! I looked for the perfect reference photo, the one that looked most like the lion I had seen, I finally found the right one the day of the conference, right before I left. On my way, I went by the art store, I have not painted much, I am more of a pastel artist, so I was asking the Father, how do you want it released? Do you want me to paint it, or draw it? When I got to the store, they had the canvases half off...and yes, they had the 36" x 48" size, it seemed to be a confirmation, so I bought it, along with 2 tubes of paint, black and white. I was literally shaking as I stood in line to buy my materials. I looked up and there was a card there. It was rainbow butterflies!!! I grabbed it too, I knew it was a love letter from God to encourage me. I took it with me and taped it onto my table when I set up. The Worship Center had told me before I could use an easel they had, so I was set. It was so funny, once I decided I would FINALLY do it, I had so much opposition. My pastor decided to invite another artist to come and paint. I was already nervous enough without having another artist that had been doing it forever beside me. Then when I finally got to the event, the directors of the venue, who had also been begging me to paint there, stopped me at the door and said, "We already have an artist." I was so determined to do what God was asking me to, I looked at them and told them, "it is ok, this ministry likes having more than one artist and I have spoken to the leader. Can you please get the easel you said I could use when I painted here?" That was so bold, and certainly a surprise because it was not like me. I knew God was in it...and this Lion in me was coming out that night for all to see!!! 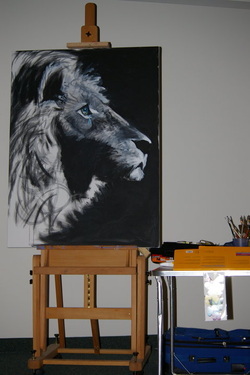 I set up and took the plastic off the canvas, when worship started, they began singing about the Lion of Judah. I knew God was encouraging me to go for it!